Moot court competitions simulate appellate oral argument before the Supreme Court of the United States. Using the Court's existing case law as precedent, competitors argue a fictitious constitutional case before a panel of judges. This is an appellate proceeding, so there are no witnesses, no juries, and no theatrics. In order to win, one must calmly advance sound legal arguments and respond to impromptu questions from judges. Law schools usually host competitions and law students, law professors, and practicing members of the legal profession judge competitors. Moot court, unlike other undergraduate competitions, plays a major role in legal education and most law schools maintain moot court teams; so the skills you learn here will translate directly into preparation for law school. Thus participation in Moot Court builds familiarity with actual case law and with the Constitution; it hones oral advocacy and analytical skills that will be useful far beyond a legal career; it brings students into contact with active members of the legal profession; and it gives students experience that will translate directly into an advantage in law school. For more information, check out the "Useful Links" box on the right, including the syllabus for our Moot Court course. For those interested in financially contributing to the efforts of the Moot Court team, please click on the link in the right-hand box titled "Donate to Moot Court." The team welcomes all tax-deductible contributions. 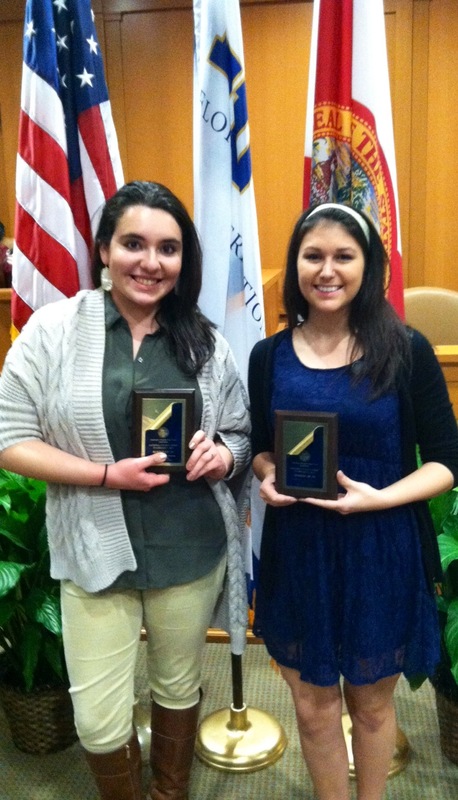 On January 16-17, 2015, Jessica Abbey (Journalism and Spanish, 2015) and Rebekah Mercer (Political Science, 2016) travelled to Miami, Florida to compete in the Moot Court National Tournament at Florida International University College of Law. 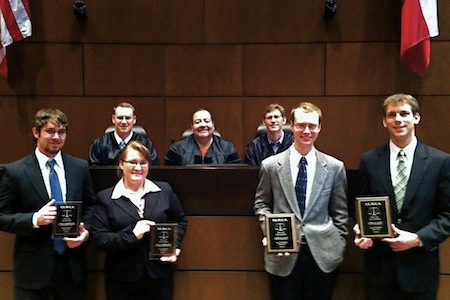 They placed in the top 8 percent of undergraduate moot court teams nationally. Rebekah Mercer and Jessica Abbey with their national awards. Jessica Abbey (Journalism and Spanish, 2015); and Kevin Burns (Graduate Student, Political Science). 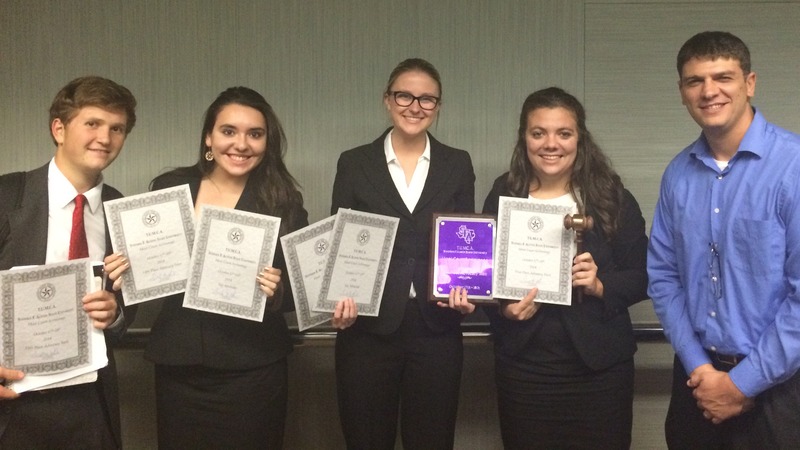 On November 14-15, 2014, two Baylor Moot Court teams competed for a chance to go to the National Competition in Fort Worth, at A&M School of Law. Jessica Abbey and Rebekah Mercer placed in the top four teams and qualified for Nationals. Additionally, top speaker awards were won by Abbey (2nd speaker) and Mercer (5th speaker). Moriah Wade (Political Science, 2015); and Matt Sayre (Political Science, 2016). 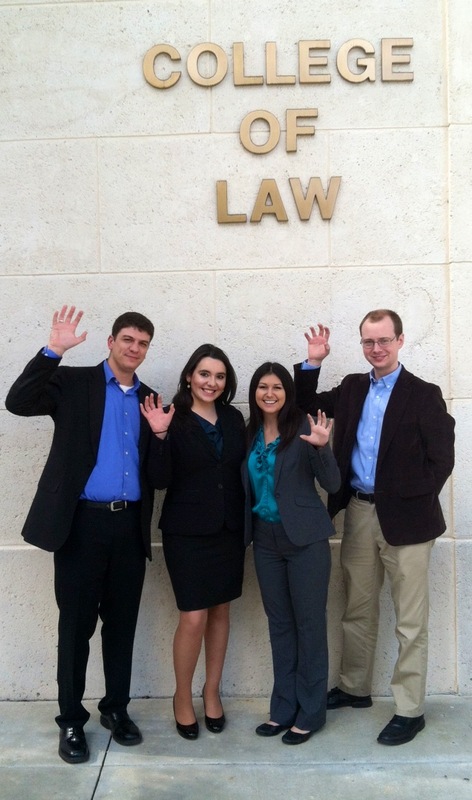 Two teams from Baylor's undergraduate moot court team traveled to Nacogdoches, Texas for a scrimmage tournament at Stephen F. Austin State University from October 17-18, 2014. The team of Julie Nelson and Rachel Reon won first place, and the team of Matt Sayre and Rebekah Mercer won fifth place. Additionally, speaker awards were won by Reon (second), Mercer (third), and Nelson (seventh). 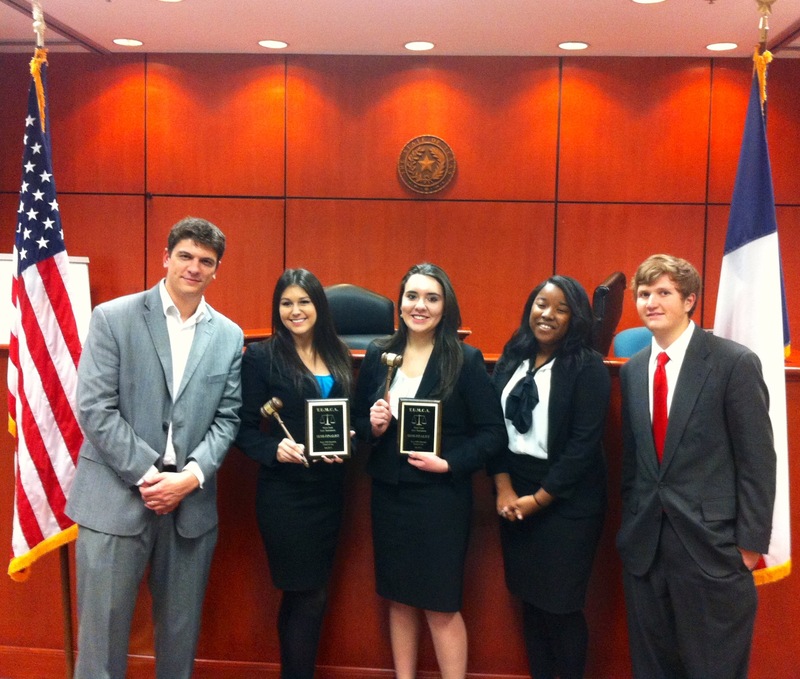 Baylor's undergraduate moot court team traveled to Texas Tech School of Law this past weekend and returned as the Southwest regional champions. Meaghan Nowell (University Scholars, 2012) and Daniel Blauser (Political Science and History, 2011) advanced to the final round where they successfully argued their case before two sitting district judges and TTU's advocacy director. 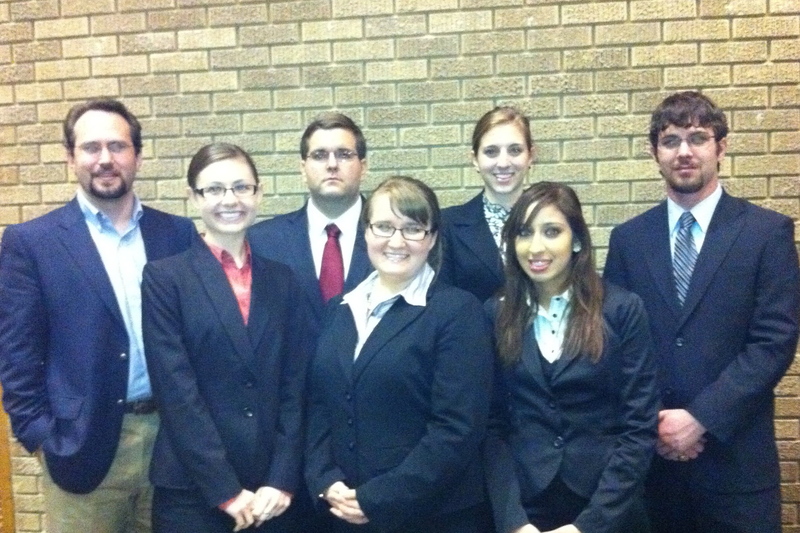 Back row (left to right): Professor Matthew Brogdon, Jesse Muth, Kristy Blurton, Daniel Blauser. Front row (left to right): Sarah Rafie, Meaghan Nowell, Yvette Gonzalez. Professor Robert Sherwin, Judge Reuben Reyes (Baylor Law 1990), and Judge Les Hatch. 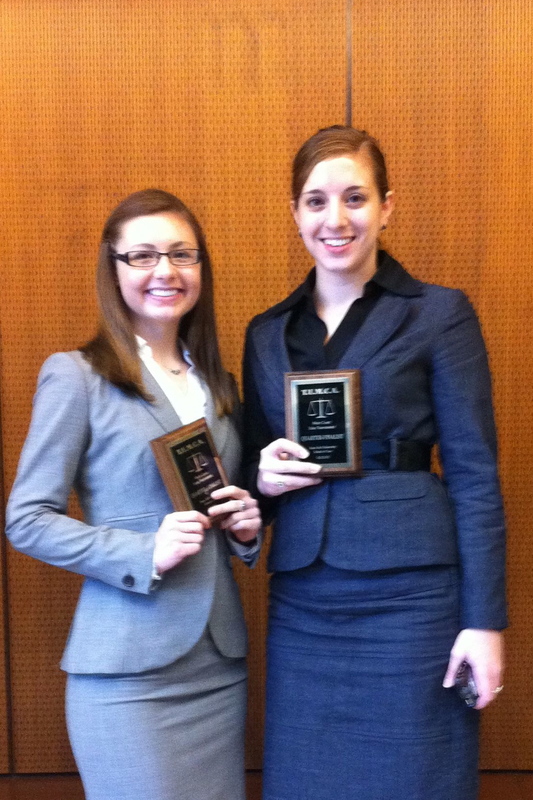 Nowell and Blauser also earned a trip to the national championship tournament at Tulane's law school next January. Sarah Rafie (Political Science, 2013) and Kristy Blurton (Psychology and Criminal Justice, 2011) likewise earned a berth in the national tournament with their impressive performance and Rafie was honored as the tournament's top speaker. Sarah Rafie and Kristy Blurton pose after advancing to quarterfinals and qualifying for nationals. This is the second consecutive year that Baylor has taken the top spot in the Southwest, and knocked off a few of our Big 12 rivals in the process - quite an achievement for a program in only its third year of existence. We are looking to build on this win as we prepare for the national tournament. Last year we returned with the second ranked team in the nation; there is only one way to improve on that.